My name is Ashley Fallon and I am a junior, class of 2016, majoring in archaeology and Near Eastern studies with a focus on ancient Egypt. I have worked with ancient ceramics in three other classes also taken in the archaeology museum, as well as in the field at the Mut temple complex in Luxor, Egypt. Ceramics have recently sparked my interest, deeply enough to consider a future career as a ceramicist, and I hope this course will further my understanding of the complex processes that went into making not only Greek ceramics, but ancient ceramics as a whole. With school cancelled due to snow and only four classes remaining before our firing, we had to be creative and hold our week six class on Adobe Connect. After some initial technological difficulties and a commendable amount of patience from everyone, we were able to hold a relatively normal class. Our guest speaker was Dr. Marc Walton, a senior scientist at Northwestern University-Art Institute of Chicago Center for Scientific Studies in the Arts. Dr. Walton explained the materials science aspects of slip (the thin clay material used the paint red-figure vases), clarifying the chemical changes in clay when it is fired, and explaining how his research on slip has presented new information and questions to consider. To understand slip, we must first understand what happens to it in the firing process used by the ancient Greeks. According to the existing literature, firing these vessels is thought to have happened in one single firing split into three distinct stages within the firing. The first stage was an oxidizing firing at 800°C, with oxygen allowed to circulate freely in the kiln, and in which the vessel lost residual water and organic material, became harder and the iron particles turned red in color. The second stage was in a reducing atmosphere at 900°C, which means that oxygen was removed from the kiln by closing all air vents. Additional organic materials such as leaves, tree limbs, and sawdust were added to the fire to produce smoke, which turned the iron particles in the whole vessel grey-black. In this stage, the slip vitrified (or became glassy), which caused the iron particles present in the slip to become encased in a glassy matrix. In the last stage, oxygen was reintroduced to the kiln as the temperature fell; areas of the vessel which were painted with slip were already vitrified, and therefore remained black. All other areas not painted with slip return to an orange color. With this information in mind, Dr. Walton went on to explain his findings that zinc is present as a trace element in slips found in ceramics made all over ancient Greece and Etruria, over extended periods of time. There are limited sources of zinc in the ancient world, including possibly from contamination of the soil, but more likely associated with mining and processing of ores such as at Laurion in ancient Greece. Walton suggests that an acid containing zinc (in the form of vitriol—commonly used in antiquity for dyeing leather, as medicine, etc.) may have been added to raw clay during the levigation process as slip was being prepared. Dr. Walton also talked to us about slip decoration. While studying the thin relief lines found painted within red figures, and the thicker contour lines painted around red figures, Dr. Walton and his team found that the raised relief lines were completely vitrified, while the flat contour lines still contained some unvitrified clay particles. This suggested that the relief lines were fired to higher temperatures than the contour lines, something that went against most of our readings—that the pottery was fired multiple times rather than all at once. The closer we get to understanding slip, the more it seems to elude us. Hana Chop and Jill Waller making horsehair brushes for painting with slip. Earlier in the week, we planned for the snowstorm by picking up the supplies we need to decorate our own tiles at home. 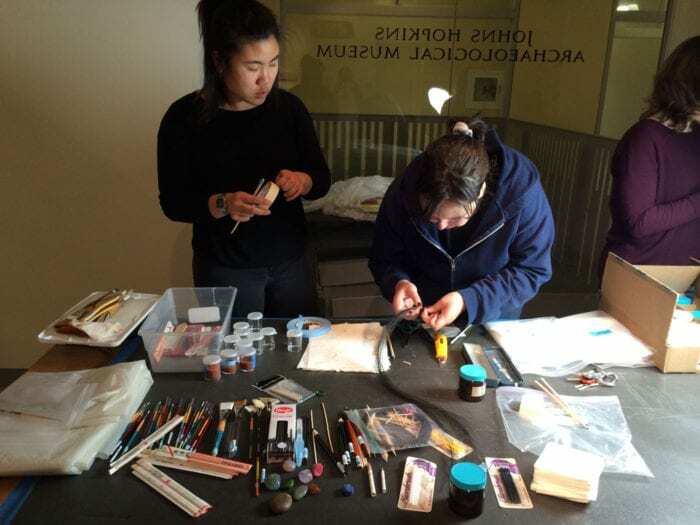 The supplies we tested last week for applying the slip were laid out on a table so we could choose those that we found worked best for each of us, including making our own chopstick paintbrushes from various animal hairs. Last week we had difficulty creating raised relief lines with the slip, and unfortunately we could not look at the cups in the archaeological museum this week for comparison. Hopefully we will be able to look at the cups outside of class and replicate the lines at home through trial and error while painting our own images. Walton, M., Trentelman, K., Cianchetta, I., Maish, J., Saunders, D., Foran, B., Mehta, A. “Zn in Athenian Black Gloss Ceramic Slips: A Trace Element Marker for Fabrication Technology.” Journal of the American Ceramic Society, 2014: 1-7. Walton, Marc et al. “Material Evidence for Multiple Firings of Ancient Athenian Red-Figure Pottery,” Journal of the American Ceramic Society, 96, 7, 2013: 2031–2035. I found Dr. Walton’s hypothesis of multiple firings intriguing, partially because it argues against the generally accepted single firing, but also because, if true, it would lead to a complete reevaluation of a number of materials from the archaeological record. Specifically, there are pieces of pottery that, until now, we have assumed were test pieces used to evaluate progress during firing because their decoration is incomplete. However, if pottery underwent multiple firings, these pieces could have been ones that failed part of the way through production and were thus caught in an intermediate stage of decoration. The idea of multiple firings could also lead to interesting explorations into the ideas of efficiency and production time. Thank you Ashley for the great post! The multiple firing hypothesis might also suggest that there were some extent of experimentation with different techniques of pottery making during the ancient Greek period. However, that would be a different kind of science: the ancient “science” looked for differences in outcomes (possibly without knowing the underlying reasons) while modern science looks for the underlying reasons (but not necessarily able to recreate those ancient objects). Until Dr. Walton’s presentation, I was not convinced that the black slip was necessarily unique from the clay body due to processing (rather than the slip clay coming from a different source than the body clay). The evidence he presented that changed my mind about this was the distribution pattern of rare earth elements found in the clay body and slip. They were very similar, except for a sharp drop in Cerium (Ce) in the slip. Alone, this was not enough to convince me that the slip gained its properties through processing. However, once Dr. Walton showed us the same data for black slip from Athens, Corinth, and Etruria, it seemed extremely likely that there was a single slip processing technique (or at least one very popular one) throughout Ancient Greece and its surrounding areas. Thanks for the post Ashley! It was great to hear Dr. Walton give us evidence for several “novel” theories, such as the multiple-stage firing discussed above. I particularly found his approach to analyzing the minerals and their quantities within the composition of both the slip and the clay body fascinating. From a scientific perspective, the tests were a very clever way to determine whether or not the slip was chemically modified compared to “normal” clay. Discovering that a very specific type of clay was used also spoke to the fact that selecting clay beds was a more complicated process than I originally believed it to be. There may have even been a method that ancient potters used to determine that the clay in fact offered the correct mineral recipe. It was very exciting to get to hear from Dr. Walton himself about the very experiments and theories we read about last week. It was especially helpful to have the visual aids! In terms of what he discussed, I really appreciated his perspective on the material science of what we are accomplishing in this class. Before this, we were very much focused on the history of kylikes and the artistic methods by which they were accomplished. We had done some work with UV analysis in the Museum, but none of the science behind how the kylikes came out of the kiln fired! In addition, Walton’s point that the slip was not remarkably different than the clay body was very surprising; I hadn’t before really understood that the slip, as a black paint, could be so similar in composition, yet produce such a different texture/result on the surface. Thank you so much for the excellent post, Ashley. Expanding upon Anna’s observation about the misfired “test pots”, Dr. Walton explained that these could be used as very clear evidence for the multiple firing theory. These pots are often times thought to be used as a way to test the kiln temperature, but this might not actually have been the case. Upon closer observation of the effects of the misfiring, the contour lines don’t seem to have been affected. According to Dr. Walton, these pots might have been originally prepared as red-figure or black-figure pots that and, as Anna mentioned, were misfired during an intermediary phase. If they were meant to have been fired in one round, the misfiring should have had visible affects on the contour lines. The fact that these lines don’t appear to have been affected at all, according to Dr. Walton, is very strong evidence that the contour lines had already been fired and vitrified, thereby protecting them from the misfiring. At the beginning of his lecture, Dr. Walton made a great analogy, comparing ancient Greek pottery to an iPhone. The gist of it was that if someone in the distant future wanted to recreate an iPhone they might be able to create a perfect, functioning facsimile, but they will never understand its biography beginning with the invention of the first transistor. This was a very sobering introduction, because it made very clear the strict limitations of the information this experiment can provide us. Understanding pottery production on a microscopic level can provide wonderful insights as to the materials used, the steps taken, and even the order of those steps, but it can never tell us the full evolutionary biography of the vessels. All throughout Dr. Walton’s a lot of the things about the slip that he was saying was reassuring and interesting to learn. When we started talking about relief lines, for example, he proved that it was most likely animal hair that made the lines but showing us the form of the lines and the topography of the relief, which was something I didn’t even know we could do. But trying to recreate these conditions is incredibly hard. So far with the experiments with the slip, I haven’t been able to create a solid relief line (with the topography) with such a small instrument. It makes me wonder if we’re missing something in the slip recipe. 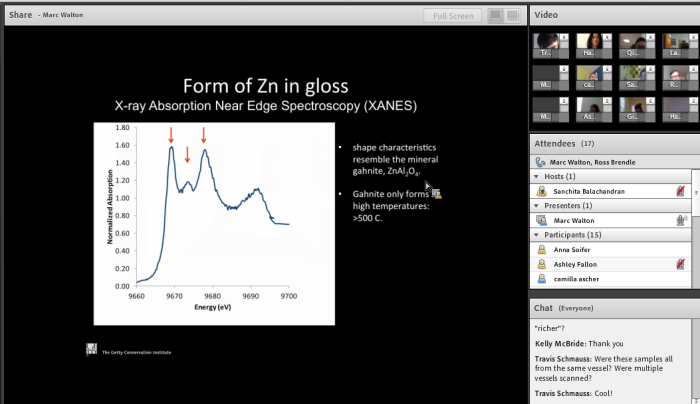 This was certainly my most unique class experience – I’ve never had an online lecture before. Thank you for simplifying the firing process! It really was exciting when even Dr. Balachandran was surprised to hear about the multiple-firings hypothesis. We should definitely discuss the implication of that in class, as well as a review of the general materials science issues that came up, as suggested by Dr. B. It was nice that Dr. Walton did a survey of all aspects of slip, not just the materials science, but also the application of the slip (with which we struggle oh so much) and the elements of the decoration. As someone who is very interested in the field of heritage materials, Dr. Walton was an inspiration. Great post! Thinking about the “test pots” as you talk about Dane, it strikes me how lucky we are to have this evidence. In the beginning of the course, we were made aware of one key statistic, somewhere around 1% of the pots that were thrown in antiquity are extant. Not only am I heartbroken by this fact, I am awed that we have these fragments available to us when so many of their finished counterparts are forever lost. They seem to be key to a breakthrough in the understanding of how the Athenians fired their pots. Perhaps if Professor Balachandran repeats this class they can test out the theory of multiple firings in later years. I found this post to be very interesting. I am not an archeology major, nor have I ever examined or studied pottery yet I found this post to be explained in simple enough terms in which I could understand despite my lack of expertise in the subject. Some very interesting facts to contemplate and look further into. Sounds like a lot of fun. Great job! What an exciting blog you have here. Nothing compares to this kind of “replication” experiment to humble even the most knowledgable scholar. Reading through this post and learning about the relief lines being more vitrified made me wonder…rather than looking to multiple firings as an explanation, I wonder if there is any evidence that the composition of the gloss used to make them might be different from that used to make the flat areas. Perhaps the slip used to make relief lines contained more flux, and therefore vitrified at a lower temp than the broad flat areas. Some deflocculants like ash, can also act as a flux. More deflocculant, more flux, more vitrification. I wonder if that theory was thrown around by your class, and if so, what did you think?